There’s something really cool about big league debuts. Presumably, for those of us not on the field, it’s the idea that someone has realized a lifelong dream that really makes these occurrences special. Most teams get to see somewhere between five and 10 a year, so they’re not so rare that they’re like a no-hitter and yet, they’re rare enough that quite often fans remember being at a big league debut for a long time to come. From a front office perspective, it’s always a unique experience, too. Of course you have the scout who signed the player with the ultimate pride and the coaches and managers and staff who helped him develop. Last night, Ned Colletti, Logan White and De Jon Watson were in the Stadium to watch, as was roving pitching coordinator Rafael Chaves, all of whom have had a hand in getting Nathan Eovaldi here by the young age of 21. There’s the historical part of it – we always try to get ticket stubs from the game, perhaps the lineup card and if there’s a victory or a hit involved, a baseball signed and dated. All of these items go into the team archives in the event the player goes on to have an All-Star or Hall of Fame career. So, while we have some really amazing artifacts of that nature from great Dodgers in the past, we also have some from guys who might have only played 10 games in the Majors before retiring. The media aspect of it always drives part of the day, too. As a starting pitcher, the media is not supposed to talk to the guy until after the game. For a position player, that doesn’t ever seem to be an issue, which is always an interesting dichotomy but just one of the unwritten rules the game. The pitcher has so much he has to think about, the last thing we want to do is bog him down with other questions and people to meet, so we let him go about his business quietly. In this case, it meant that we didn’t find out until postgame that the ‘o’ in his last name is silent. His name is simply pronounced E-Valdee. At least we got the Nathan part right, as he prefers that to Nate. With Nathan already in the clubhouse late in the game, I had to go downstairs in the top of the ninth to see if we could coax him out on the field postgame for a live interview with PRIME Ticket. Of course, you don’t want to jinx anything by saying, “Hey, if we win can you go out on the field?” and yet you have to still do it or you miss a big opportunity. After realizing that it wasn’t an interview on the big screen board, Nathan agreed to do it and as you can imagine, when the D-backs started to threaten in the ninth, I thought I had jinxed it and blown this poor kid’s first big league victory. 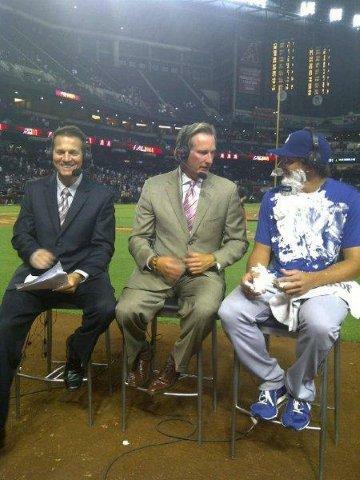 Fortunately, Elbert came through and the team held on so after the last out, we got Nathan to head out to the field, just in time for Blake Hawksworth to give him a shaving cream pie in the face. Hopefully, it’ll be a moment to remember for him and 20 years from now, having it all on video will be well worth it. Now he gets to spend four days watching big league baseball, taking it all in, and yet working hard for his next start, whenever that comes. But for those who were on hand to see it, it’s likely something they’ll remember for many years to come. There’s a lot going on these days at Dodger Stadium, and that’s a great thing. With Juan Uribe flying to Los Angeles to take his physical, Ned Colletti and his staff obviously realized that once he passed, we would have an extra infielder (Ryan Theriot) and he had a deal in place to move Ryan to St. Louis in exchange for Blake Hawksworth. News like this tends to have a lot of moving parts, with Uribe heading to the doctor for the physical, sorting through the media availability for various players, making sure that word of a trade doesn’t get out before the players hear it from their respective teams. So of course, with that, is a lot of internal planning. But, we have a great front office and PR department, medical staff, etc. who helped today run seamlessly. We got word that Juan was official and let the media know that the deal was done and that he’d be available on a conference call. From there, Ned had to call Ryan and let him know that he had been traded to St. Louis. And then, Juan headed to the stadium for a quick visit with team officials, a tour of the clubhouse and the conference call before he grabs dinner and catches a very early morning flight back to the D.R. He couldn’t have been a nicer guy and his wife was also very kind. He said that Manny Mota pretty much called him every day after the World Series telling him how much the Dodgers wanted to see him in Blue and he said that it was very meaningful to him that the team cared so much about him. Before they took off from the stadium, we armed them with all sorts of hats and Dodger items to bring back to the Dominican and we’re certainly looking forward to having him on the team in 2011. For those who follow such things, Blake is on Twitter @blakehawksworth but he’s yet to weigh in via that account…still, I’m sure he’ll be picking up a lot of L.A. followers. And hopefully he’ll add a nice arm to the bullpen for 2011. Ned seems to still be on the hunt for more pitching, a LF and, as he says, to sort through the catching situation. Stay tuned…we certainly hope everyone had a great Thanksgiving holiday.